In the world there are many different cool cars, among which Ferrari stands apart. This car, along with Lamborghini is the dream of many people for many decades. 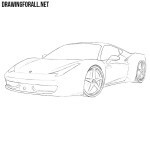 In previous lessons we showed how to draw this beautiful sports car, but that lesson was too hard, so today we will show how to draw a Ferrari easy. The first thing we need to do is delineate the outlines of the Ferrari body. Use smooth and light lines, as in the example below. Recall that you need to try not to press on the pencil too hard. Add some details to the body of the Ferrari. In front draw the headlights and bumper. 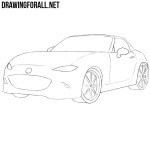 In the same step, we sketch out the wheels of our sports car. This step should also be performed using light lines. Sketch out the outlines of narrow windows and rear-view mirrors. Next, sketch the outlines of the arches and make the wheels more voluminous. From step number four we will use darker lines. Let’s start drawing out the Ferrari using darker lines. Thus we outline the bumper, hood, headlights and radiator grill. Delete unnecessary guidelines from the front of our supercar. We continue to draw out the Lamborghini. Continuing the lines of the hood, we gently draw the flat roof that flows smoothly into the back. Next draw the narrow Ferrari windows. This lesson will be quite difficult, since here we will draw out the side surface of Ferrari. Carefully draw out the door, the handle on the door and the air intake. Now we need to be very attentive. 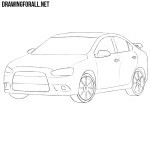 With the help of smooth and dark lines draw out the wheels and the outlines of the wheel arches. Remove all remaining unnecessary guidelines from the Ferrari drawing. In order to draw the rims correctly, we first outline the central part of the rims. Next, draw out the spokes, which diverge from the center towards the edges of the rims of our Ferrari. 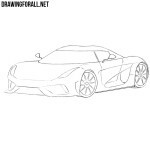 As we said earlier, we love to draw cool sports cars and supercars, and we try to make them the most realistic. 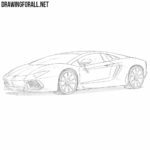 But our readers often ask us to show a lighter version of drawing specific cars, and so today we showed you how to draw a Ferrari easy. If this lesson seemed too simple to you, then go to other lessons about Ferrari and other supercars from the category “Cars” on drawingforall.net. Accidentally I opened your site when searching related with designing word. Now I surprised what a wonderful drawings you did here. The Ferrai drawn here mesmerized me. 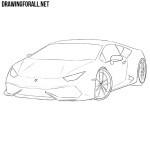 I try to follow the steps given by you and got a superb Ferrai Drawing. Thanks for your effort and expecting more and more drawings.